You are currently browsing the tag archive for the ‘french brocante’ tag. “Clowns of the Sea” Greeting Cards by Sarah Vernon | Redbubble #Sold! Features / Creation 24 April 2016 / Digital Collage in Photoshop. Puffins: ‘Nicknamed ’sea parrots’ – and sometimes ‘clowns of the sea’! – Atlantic puffins have black and white feathers and a large parrot-like beak. They are small seabirds measuring around 25cm in length.’ / 2 Lil’ Owls – 2LO~French Script antique papers 2-13. / Puffin – Biodiversity Library. / Flora – Biodiversity Library. • Also buy this artwork on stationery, apparel, stickers, and more. You may have realised I’ve been off the grid for the last few days. This is because I had my greatest friend staying and we had not seen each other for far too long. A glorious time was had by all! I am tired but happy and hope to be back to normal with all three blogs by Tuesday. I have a passion for stationery, the more beautiful the better. Having said that, even a plain white envelope has a charm all its own. Classic envelope for invitations and greeting cards. 7 ¼” wide x 5 ¼” high. Works well with laser or inkjet printers. Made for 7″ x 5″ or smaller invitations and cards. Includes free inside printing. Designer Tip: To ensure the highest quality print, please note that this product has multiple customizable design areas. The unfolded outside design area measures 9.2″ x 11.3″. For best results, please add 1/8″ bleed. The unfolded inside design area measures 9.2″ x 11.3″. For best results, please add 1/8″ bleed. Your business and personal mailings will stand out with this smooth, vibrant, matte, 80lb text-weight paper. Contains 50% recycled content (10% post-consumer and 40% pre-consumer waste). The ‘Queen of Cushions’, as Beetley Pete calls me, is back! 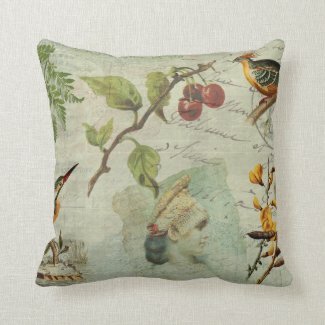 Accent your home with custom pillows from Zazzle and make yourself the envy of the neighborhood. Made from 100% grade A cotton, these pillows are the perfect complement to your couch! Look at me, Ma — I have created something else out of The Fruit Look! A few subtractions, a few additions with the ephemera from Design Cuts and the Biodiversity Library on Flickr and I have done something different. It’s recycling if you will. Clowns Of The Sea Duvet Cover by Sarah Vernon. Available in king, queen, full, and twin. Our soft microfiber duvet covers are hand sewn and include a hidden zipper for easy washing and assembly. Your selected image is printed on the top surface with a soft white surface underneath. All duvet covers are machine washable with cold water and a mild detergent. P.S. Wisdom tooth removal today. Ha! Pot-pourri Duvet Cover by Sarah Vernon. Available in king, queen, full, and twin. Our soft microfiber duvet covers are hand sewn and include a hidden zipper for easy washing and assembly. Your selected image is printed on the top surface with a soft white surface underneath. All duvet covers are machine washable with cold water and a mild detergent. 2 Lil’ Owls – 2LO~French Script antique papers 2-13. Flora & Fauna – Biodiversity Library. 1. Nicknamed ‘sea parrots‘ – and sometimes ‘clowns of the sea‘! – Atlantic puffins have black and white feathers and a large parrot-like beak. They are small seabirds measuring around 25cm in length. 2. Puffins spend most of their lives out at sea, resting on the waves when not swimming. Their range spans the eastern coast of Canada and the United States to the western coast of Europe. 3. A puffin’s beak (or bill) changes colour during the year. In winter, the beak has a dull grey colour, but in spring it blooms with an outrageous orange! It’s thought that the bright colour helps puffins assess potential mates. 4. Puffins are carnivores and live off small fish such as herring, hake and sand eels. First Night Design | Birdcage Blossom Clock #Sold! I’m delighted to have sold a Birdcage Blossom Clock! Thank you to whoever was smitten enough to buy it. A melange of vintage art and textures from 2 Lil’ Owls, The Graphics Fairy, Design Cuts, the Vintage Design Company, Biodiversity Library and Wikimedia.